Brookline residents may have heard about protests over a natural gas pipeline in a rural area or found a diatribe on the needs for or the evils of pipelines. As with many energy issues, information from state governments, industry sources and advocacy groups may be compromised: patronizing, frozen into agendas or blind to practical affairs. In addition, New England is served by four ocean import terminals for liquefied natural gas (LNG), with total capacity about 3.2 Bcf/d. However, because of high prices in overseas markets, during 2011 through 2014 only the Distrigas terminal in Everett, adjacent to Boston Harbor, received deliveries. The operator, GDF Suez, had long-term contracts at favorable prices. A west-to-east pipeline entering through Connecticut was built by Algonquin Gas Transmission Co. of Boston, a partner with Texas Eastern Transmission Co., operating lines from the Gulf and Southwest. 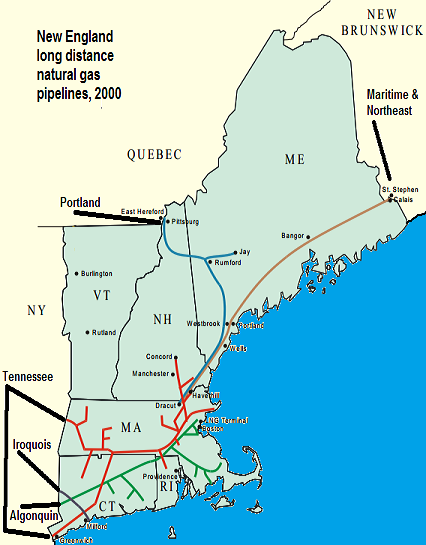 A west-to-east pipeline entering through Massachusetts was built by Northeastern Gas Transmission Co. of Springfield, MA, a partner with Tennessee Gas Pipeline Co., also operating lines from the Gulf and Southwest. Fierce competition over rights to New England territories was resolved in 1953. The former Federal Power Commission (since 1977 FERC, the Federal Energy Regulatory Commission) allowed both companies to operate in separate territories. By that point, they had substantially completed the two pipelines. The Northeastern line was later acquired by Tennessee Gas Pipeline, now a division of Kinder Morgan of Houston, TX. It is currently designated as part of the Tennessee pipeline system. The Algonquin line now operates as a division of Spectra Energy of Houston, TX. Since 1954, the two lines have been interconnected at Southington, CT, where they cross, tending to limit monopoly power of either company. New gas pipeline capacity: In recent years, owners of the two largest New England pipelines began new competition, proposing major expansions. As Prof. Christopher Castaneda of California State at Sacramento described in his 1993 book, Regulated Enterprise, during the early 1950s Tennessee Gas Pipeline aimed not only to dominate New England markets but also to export natural gas to Canada. Under Kinder Morgan management, the Tennessee pipeline company appears to have begun playing the same games again. Its current play, up to 2.2 Bcf/d, most recently called Northeast Direct, has been promoted for over three years to state and local governments and modified at least twice but still not formally proposed to FERC. Northeast Direct needs major new rights of way. It was first proposed across northern Massachusetts. After strong protests, it was rerouted early this year, partly through southern New Hampshire. As of April, 2015, according to Northeast Gas Association, Northeast Direct had customers for only about 23 percent of the proposed capacity. Excess capacity appears useful mainly to reverse flows along the Maritime & Northeast line, sending U.S. gas northward into eastern Canada, where there are few current, underserved customers. Instead of one big play, Spectra developed three smaller ones, mostly using existing rights of way for the Algonquin line. Its Algonquin Incremental Market (AIM) was approved by FERC in March, 2015, and is now underway. AIM will provide 0.34 Bcf/day increase in capacity, adding about 37 miles of pipeline and raising compressor power at stations in New York, Connecticut and Rhode Island. 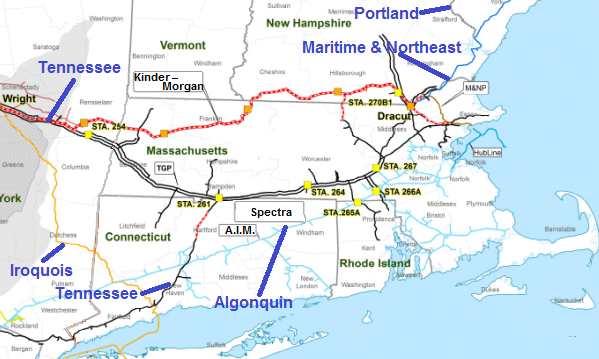 Another Spectra play called Atlantic Bridge, not yet formally proposed to FERC, would add compressor power at two stations in Connecticut and at Weymouth, MA. The latter connects to Beverly, MA, and to the Maritime & Northeast line via the Hubline–completed under Boston Harbor in 2003. Apparently unable to attract enough customers, this spring Spectra reduced proposed capacity from 0.22 to 0.13 Bcf/d. The Hubline was built for north-to-south flow, supplied from Canada, but Atlantic Bridge appears intended to reverse the direction, sending U.S. gas northward, potentially into Canada. The largest Spectra play is called Access Northeast, also not yet formally proposed to FERC. It would add up to 1.0 Bcf/d through changes along current Algonquin rights of way. New England’s largest two electricity distributors, Eversource (formerly NStar) and National Grid, recently proposed to invest in 60 percent of that project. Involvement in a long-distance gas pipeline is outside the charters of Eversource and National Grid. They are local electricity distributors, not generation companies, transmission companies or long-distance pipeline operators. It would tend to put them into gross conflicts of interest, selling wholesale gas delivery to generating plants from which they buy wholesale electricity. More natural gas capacity? : Does New England need more natural-gas pipeline capacity? The most prominent evidence from pipeline companies and their business allies has been electricity price spikes in mid-winter–strong during early 2013, 2014 and 2015. Long-term contracts caused natural gas to be allocated to heating customers, limiting supplies at combined cycle, natural gas-fired plants that generate the largest share of New England electricity. During 2013 and 2014, ISO New England coordinated “winter reliability programs”–installing burners and filling tanks with refined fuel oil and liquefied petroleum gas at some generating plants. The ISO New England pilot program in early 2014 was ineffective, but the next one in early 2015 appeared to moderate price spikes. That program was helped by a milder winter and by prices of crude oil falling since July, 2014, which lowered worldwide prices of natural gas and led to renewed ocean imports. The annual average wholesale electricity prices through March 31, from April 1 of the previous year, show the sway of the ISO New England price bulge in early 2014 and the more moderate average prices before and since. Pipeline promoters claim New England suffers from a shortage in natural gas delivery capacity of 2 Bcf/d or more. However, their estimates are for worst cases, they apply to only 5 to 7 weeks in deep winter and they assume no added ocean imports. Operators of natural-gas ocean import terminals say they have more than enough capacity to supply winter needs and say lower worldwide gas prices make that financially reasonable. Since spring, Maura Healey, elected last year as attorney general of Massachusetts, has urged caution on gas pipeline projects. Assistant Attorney General Christina Belew of the Energy and Telecommunications Division called the proposed projects “an inefficient expense…units added would be minimally utilized.” Ms. Healey’s office contracted with Analysis Group of Boston for a comprehensive study of “energy resource options to meet [electrical] reliability needs” through 2030, now underway and to be completed by October. Industry greed: For about 60 years, starting around 1950, New England natural gas prices remained higher than prices elsewhere in the U.S. In the 1970s and 1980s, imports of natural gas to Boston Harbor from Algeria and later from Jamaica proved favorable. Starting around 2010, gas from Appalachian shale began to reduce prices in the Northeast. 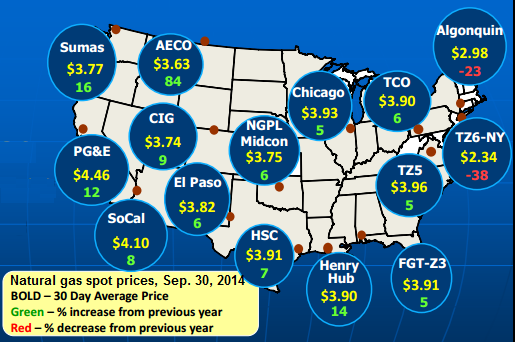 Recent natural gas prices in New England and New York have often been lower than U.S. averages. As oversupply emerged in Appalachian shale gas and prices started to fall, pipeline companies began to see opportunities. In 2013, FERC allowed Millenium Pipeline Co. a capacity enhancement for the Empire line into the New York City area. In December, 2014, FERC approved an application from the Williams Co. of Tulsa, OK, to build a new Constitution pipeline from the eastern Pennsylvania gas fields to Wright Township, Schoharie County, NY–a major pipeline interconnection junction. In February of this year, Repsol, which has operated the Canaport ocean import terminal for LNG in New Brunswick since 2008, applied for a permit to build an export terminal, at 0.75 Bcf/d. The terminal is connected via the Brunswick pipeline to the Maritime & Northeast pipeline. Declining gas production in eastern Canada could not sustain Canaport exports. Instead, the recent proposal appears to be a year-round opportunity for the Spectra and Kinder Morgan projects to ship gas for international export. In August of this year, the National Energy Board of Canada awarded a license to Pieridae Energy to export LNG from Goldboro, Nova Scotia. Like Canaport, Pieridae would lack a reliable supply of Canadian gas and need to draw on U.S. pipelines. The U.S. Department of Energy previously approved a permit allowing Pieridae to export 0.80 Bcf/d of U.S. natural gas through its Nova Scotia facility. Traditionally, pipeline promoters tend to wrap themselves in patriotic garb and promise prosperity, but history indicates they have only been interested in profit. Low prices for Appalachian shale gas and high overseas prices obviously point toward setting up ocean exports from the East Coast. Such a process would couple Appalachian gas into international markets–likely raising prices for New England. New England is unlikely to be well served by encouraging new natural gas pipelines, when it can probably manage demands for electricity through conservation, increased efficiency, added renewable sources, short-term fuel substitution and ocean imports of natural gas. Utility sponsorship of a pipeline project could be disastrous, loading ratepayers with year-long costs in exchange for only month-long benefits and enriching pipeline promoters through public subsidies–feeding industry greed instead of meeting public need. This entry was posted in Business, Environment, History on August 29, 2015 by Craig Bolon. Brookline has had multiple telecommunications services for over 30 years, but they are so different in structure and focus that there has been far less competition than an outsider might expect. Once established, companies tend to march in place. Resident companies: Resident telecommunications companies in Brookline–newest to oldest–are RCN beginning 1993, Comcast beginning 2006 (originally Times Mirror 1981, then Cox 1995) and Verizon beginning 2000 (originally New England Telephone 1883, then NYNEX 1984, then Bell Atlantic 1997). These companies all have cables under or above streets serving nearly all Brookline businesses and residences. Each of the companies has a different base of technology and a different service focus. Verizon and its predecessors offered only analog telephones to the general public for more than 70 years. Eventually, the telephone services could be used for digital data by connecting them through modems, starting in the 1950s. Comcast and its predecessors focused on cable television. The frequencies and bandwidth were much too great to be carried over Verizon’s copper wire pairs, or so it was thought at first, giving this succession of companies another type of natural monopoly for a time. RCN focused on Internet services at first but also provided cable television. The bandwidth needed for thousands of broadband Internet channels was a step beyond that needed for tens of television channels, giving this company a natural monopoly for a time. Technologies: Founding eras of the original companies led to different bases of technology. Verizon has a network of copper wire pairs, some over 100 years old, installed for analog telephone service. Comcast has foil-over-foam coaxial cables, a technology advance of the 1960s for video signals. RCN has fiber-optic cables, a fully digital technology practical on a municipal scale by the late 1980s. For more than a decade, all three resident companies have offered a mix of similar services. All promote so-called “bundles” of telephone, television and Internet services but also sell separate services. A key element for Verizon is so-called DSL (digital subscriber line) technology, transmitting broadband signals over copper wire pairs for up to about 3 miles–thought impossible or impractical before the middle 1990s. Since the middle 1990s, Comcast and its predecessors have encountered an increasing frequency of signal quality problems, according to Stephen Bressler, who was for many years telecommunications coordinator for Brookline. Their cable technologies are usually regarded as reliable for around 20 years, and cables are now well beyond that nominal service life. Except in small patches, Comcast, recently rebranded as Xfinity, does not seem willing to renew its main infrastructure. Customer service personnel are described often as unresponsive and sometimes as worse. Of about 180 Yelp reviews for the Boston area as of August, 2015, all but three rated the Comcast (Xfinity) service at “one star,” the lowest rating–an astonishingly negative set of reviews. RCN fares better with online reviews but hardly well. Many complaints concern erratic Internet and poor response to outages. Remember that with cable Internet one is sharing bandwidth with neighbors, predictably causing slower response at popular times of day. RCN will not install premise wiring. One will need to provide coaxial cable between the service connection and the point of use. If trying RCN for Internet, it’s probably best to buy one’s own cable modem rather than rent from RCN. Complaints suggest that RCN tends to shrug off problems with cable modems, including those the company supplies. The cost will typically be recovered in about a year. Check with RCN to see that a prospective unit has been approved for use with their cable service. Verizon experiences increasing problems maintaining broadband Internet over its aging copper wires. Every August, temporary installation crews come in to help with changes when large numbers of tenants typically move. Most are not familiar with Brookline wiring and equipment. They predictably create large numbers of problems that can sometimes take weeks to resolve. Paper-ribbon, 19 AWG wire-pairs from the 1920s and paper-pulp, 22 AWG improvements from the 1930s are fragile and suffer from humidity. DSL can be a tricky service to use and maintain. Technologically skilled people can get considerable help from DSL Reports online. Verizon may have sold more DSL service in Brookline than it can reliably provide. The company cannot readily expand capacity, owing to decades of shortsighted practices. Newer cable segments jammed alongside older ones, without reorganizing wire pairs, have clogged the space in underground ducts. Some technicians say long-term records of wire-pair assignments by cable segment have become haphazard. Competition: Obviously knowing that it operates the most capable technology, RCN resists offering price competition, although it now sells unbundled services. As of summer, 2015, its lowest performance Internet service is priced on a par with Verizon’s highest priced DSL but delivers about three times the bandwidth that Verizon usually provides, when Verizon DSL services are working well. However, after the first year, RCN hikes the price of its lowest performance Internet service in steps until it costs about twice as much as Verizon’s highest priced DSL service. Comcast (Xfinity) does not look as though it intends to compete. Reliability of its service has been reported as so dim for so long that only unwitting prospects, who have not learned about problems, and those who find themselves locked in because of apartment wiring seem particularly likely to become new customers. During leadership by Brookline resident Ivan Seidenberg, from 2000 through the end of 2011, Verizon promoted a fiber optic Internet service called FIOS. Verizon accepted billions of dollars in federal subsidies when committing to install that service. FIOS remains unavailable to nearly all locations in Brookline, and it might never become available. Equipment was reportedly installed in Brookline, but it has reached few if any homes and businesses. 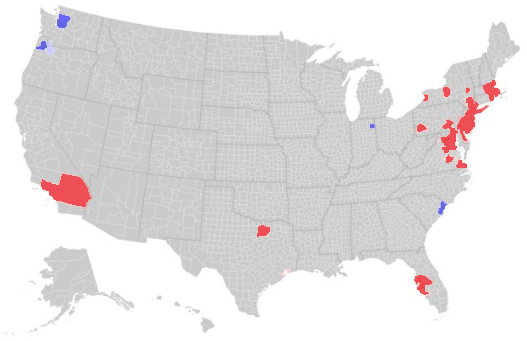 Nationwide, FIOS availability is very spotty, as shown in a coverage map prepared by an independent organization. Unlike the original map, which tries to show “percentage” of coverage with shading, the above, reduced scale map has been altered to a uniform color where at least some coverage was reported. The “percentage” map was clearly missing actual conditions in areas of metropolitan Boston. The original, full scale map and information about how it was assembled are available from Fiber for All of Sarasota, FL. AT&T claims to be developing a competitive fiber optic network to be called U-Verse, but no such Internet service has been reported as available anywhere in Massachusetts, only telephone and television services that may or may not be distributed by fiber optics. Regulation: Brookline is now unable to monitor or investigate telecommunications services. After the retirement of Mr. Bressler last year, Brookline has effectively had no regulation. No one on town staff and no member of a standing board or committee has the needed combination of technical knowledge and business experience. Anyone able to perform such work competently would make an unlikely candidate to tolerate the political committee appointments and domineering practices of the current, technologically challenged Board of Selectmen. This entry was posted in Business, History, Information on August 22, 2015 by Craig Bolon. Budding environmentalists in urban New England mostly have yet to meet counterparts in the mountain areas of Maine, New Hampshire and Vermont. They have related concerns, but they also have far different outlooks. Some urbanites are lathered up over renewable energy, although few have practical experience producing any. Many northerners have come to regard urban energy campaigns as attacks on their living environments. For wind and solar, a critical element that varies with location is capacity factor, CF: the actual average output divided by the peak rated output. National assumptions proved optimistic for wind and solar in New England, where the typical long-term average capacity factors have been documented at about 24% for land-based wind farms (in Maine) and at about 13% for solar farms (by DC ratings). Keep in mind that retail electricity rates add transmission and distribution charges, averaging about $0.12 per kWh for New England residential customers last year. The full, social cost of wholesale electricity from land-based wind farms in New England, including public subsidies, is about twice the cost of wholesale electricity from the combined-cycle, natural gas-fired plants that produce the largest share of the region’s power. So far, there has been no New England experience with ocean-based wind farms. Alternatives have not yet proven successful. New England generates much more energy burning wood and waste than it gets from wind and solar, but pollution around wood and waste plants is causing health hazards. The region is unlikely to accept more environmental burdens from wood and waste. Attempts to extract energy from ocean waves and geothermal sources have stalled because of equipment failures and high costs. When we do commit to spend money in New England for renewable energy in order to provide environmental benefits, for the amount we spend we get about twice the benefits buying energy from land-based wind farms as we get buying energy from solar farms. However, state and federal subsidies have distorted finances, as seen by nearly all the public, tending to promote socially unsound investments. Obstacles: In Massachusetts, former Gov. Patrick began service in 2007 with enthusiasm for building wind farms. However, most projects were small. During his two terms, 36 wind projects opened, but their total average output is only about 27 MW–about one part in 230 of the state’s average 6,310 MW electricity draw in 2013. Protests gathered over dangers, health hazards and conservation issues. Massachusetts offers few wind turbine locations that are a mile or more from homes and worksites. Former Gov. Patrick’s second term pulled away from wind and began promoting solar projects with major subsidies. A large but hidden subsidy involves so-called “net metering.” That allows many projects to send electricity into the grid and get full credit at retail prices. The effect is to exempt owners of those projects from paying a fair share of costs to maintain the distribution network. All the other customers wind up paying those costs for them. Starting in 2011, the Shumlin administration in Vermont soon copied the Patrick administration. After an early courtship of wind power, it backed away and began promoting solar farms. Vermont was left with three fairly large wind projects–Sheffield, Lowell Mountain and Georgia Mountain. Despite a far smaller population, it hosts more installed wind capacity than Massachusetts. The major wind-power state in New England has long been Maine. It hosts about 52 percent of the region’s installed capacity. However, current Gov. LePage opposes expansion, saying wind is too expensive. Now that he has replaced nearly all appointees of his predecessor, former Gov. Baldacci, disapprovals of wind projects have multiplied. Boston-based First Wind, once the state’s leading developer, gave up and sold out to TerraForm of Maryland. Comparisons: Contrary to some impressions, New England made a late start and achieved only slow growth in wind generation of electricity. The region’s track record in solar electricity has been even later and slower. Each of the leading wind states–Texas, California and Iowa–vastly outperformed all the New England states combined. Installed wind capacity in New England is also well behind the national average of 132 peak watts per person. New England’s largest untapped source of land-based wind power is among the Longfellow Mountains–as known since 1959–in the far northwest of Maine. Aside from strong winds, key advantages and key limitations are the same: remoteness and very sparse population. There are no major transmission lines. Nearly all the infrastructure would have to be built from scratch. For wind power, that is very costly. Transmission lines have to be scaled by peak loads they service. A line serving large wind farms, running at only 25 percent capacity factor, costs much more than a line carrying the same average load serving a large gas-fired generator, running at 75 percent capacity factor. So far, no company has been willing to propose a transmission network for the Longfellow Mountains, so of course no wind farms are being built there. By national standards, New England wind and solar power are rounding errors, only about one part in 50 of the region’s electricity. However, because they are so small they can be carried at nearly negligible costs by current infrastructure: transmission lines and natural gas-fired and nuclear generators. Were they more successful, costs of integration into the power grid would become far more than are currently included in the levelized cost estimates from the U.S. Department of Energy. Imagination: Every New England state now has a “renewable portfolio” law. For 2015, these require that 8 to 19 percent of electricity be obtained from “renewable” sources. Averaged by electricity use, they set a combined requirement for 2015 of 12 percent “renewable” electricity. So far, the New England laws amount to a political joke. For 2014, New England obtained only 2.1 percent of electricity from wind and solar sources. So-called “requirements” of New England laws are met only through creative relabeling, exceptions, excuses and outright scams. Some enthusiasts and political operators continue to imagine that people can somehow increase the supply of renewable energy merely by adding to the demand. They promote a variety of top-heavy schemes, including arbitrary escalators on “renewable portfolios” and community power-purchase programs. They ignore markets, which do what they will with supplies and demands. 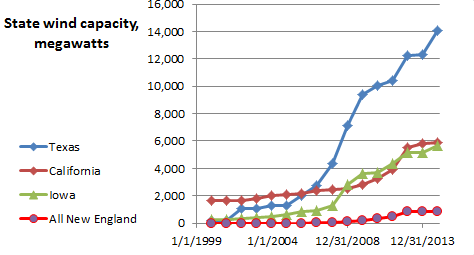 Demand for wind and solar power in New England already outpaces supply by about 6 to 1. When people run up demand without increasing supply, prices rise. Adam Smith told about that. This entry was posted in Business, Environment, History, Regulations on August 15, 2015 by Craig Bolon. A chain of disputes over rights to the Happy Birthday song–a controversy now stretching over more than 80 years–recently enjoyed a revival with a federal lawsuit being heard in California. It was brought by Jenn Nelson, a video producer in New York who has been assembling a documentary about the saga. A key, unresolved issue throughout long controversy has been lack of a clearly established author of the song. Disputes: Ms. Nelson reluctantly paid a subsidiary of Warner/Chappell Music of Los Angeles, who claim to own interest in a copyright, a royalty of $1,500–so that her video could use the song without wrangling over an infringement lawsuit. After a slow burn, she found a New York lawyer, Randall S. Newman, who was willing to challenge the copyright claim. Mr. Newman filed suit in New York on June 13, 2013, joined by Mark C. Rifkin of Wolf, Haldenstein, Adler, Freeman and Herz. The venue proved questionable, and a new complaint was filed in California later that month. Circumstances of the Happy Birthday song have been contentious. Disputes began in 1934 with a charge against producer Sam Harris and composer Irving Berlin, who included the song in a Broadway musical without an agreement. Robert Brauneis, a professor at George Washington University Law School, explored origins of the song and legal issues about it in a 92-page journal article published in 2009, plus supplements available from the law school. Origins: While working at the Louisville Experimental Kindergarten School in the early 1890s, Mildred Jane Hill and Patty Smith Hill composed a song with the same melody and different lyrics. Mildred Hill was a professional pianist and organist who taught at the school. Her sister Patty Hill had trained as a teacher at the school and then become principal. A pioneer in early childhood education, she later became a professor at Columbia University. The sisters collaborated on songs to appeal to and be easily learned by young children. 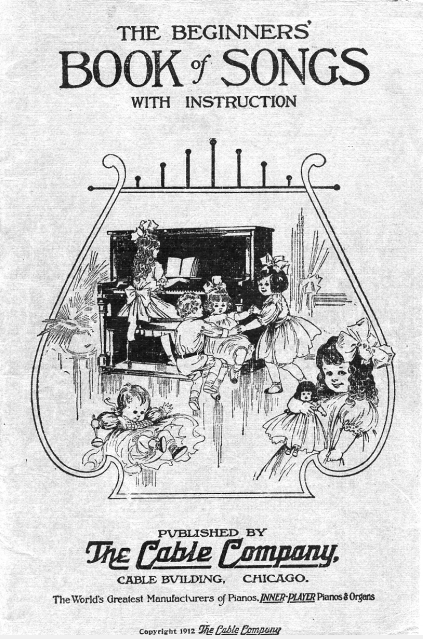 Subsequently, the Clayton F. Summy Co. republished Good-Morning to All in 1899 as part of Song Stories for the Sunday School and in 1907 as a free-standing composition. In each case of publication, according the original complaint in the recent lawsuit, Mr. Summy or the Summy company applied for copyright registration and asserted that Mr. Summy or the company was “proprietor” of the work. No Summy publication included the “happy birthday” lyrics, only the “good morning” lyrics. Changes and infringement: The trail diverged in 1912, after a large, Chicago-area piano manufacturer, The Cable Company, published and began to sell The Beginners’ Book of Songs. For a song titled Good-Morning to You, alternatives to “good morning” were shown in subtitles as “good bye” and “happy birthday.” Key, melody, main lyrics and piano arrangement were the same as Good-Morning to All in Song Stories for the Kindergarten from the Clayton F. Summy Co., still under copyright. As published in The Beginners’ Book of Songs, no authorship, permission or copyright was cited for Good-Morning to You. That looks like infringement. However, this 1912 publication also introduced into commercial circulation the “happy birthday” lyrics in combination with the “good morning” melody. Any later attempt to claim original authorship of the “happy birthday” lyrics, alone or in combination with the “good morning” melody, could suggest plagiarism. So far as can be seen in records from the recent lawsuit, neither Mildred Hill nor Patty Hill claimed authorship or left unpublished manuscripts for the “happy birthday” lyrics or for their combination with the “good morning” melody. According to Prof. Brauneis and as recited in the original complaint for the recent lawsuit, the Clayton F. Summy Co. did not seek copyright extension for the publication of the Good-Morning to All song occurring in 1893. Later publications notwithstanding, melody and lyrics of that song could have entered the public domain when their 1893 copyright term ended in 1921 without renewal action by the “proprietor,” Clayton F. Summy or the Summy company. Lawsuits and arguments: That situation is now presented to a federal court in the Central District of California. Judge George H. King, the chief judge of the district, has something of a mess to clear, mainly because of lapse of time but also because of several actions during the previous 81 years to prosecute a claimed but vaguely justified copyright. Supposed rights to the Happy Birthday song may never have been enforceable. No authorship for the “happy birthday” lyrics or for their combination with the “good morning” melody appears to have been claimed at or before publication in 1912. Without an author, there is no copyright interest. [See note, below.] However, arguments in the recent case became tangled–tending to obscure some elements of copyrights. Judge King does not have a particularly strong record when dealing with intellectual property. In Alfred Mann Foundation v. Cochlear, a patent lawsuit beginning as Central California case no. 07-cv-8108, he was overruled by the Court of Appeals for the Federal Circuit in 2010 [case no. 2009-1447], which found faulty justification from Judge King for holding that plaintiffs in the district court case lacked standing to sue. The Clayton F. Summy Co. was sold in 1930, into what became a succession of organizations. When lawsuits began in the mid-1930s, the Happy Birthday song had been published several times before, essentially in the form it is currently performed, without claims of authorship or copyright and without prior challenges for infringement. By at least 1922 it was a known work, published in full and combining the “happy birthday” lyrics with the “good morning” melody. Aggressive copyright prosecutions look to have begun with efforts by Jessica Hill, youngest sister of Mildred and Patty Hill, after Mildred Hill died in 1916 and Jessica Hill, who played no role in creation of their songbook, inherited a potential interest in the songs. In a brief filed July 28, 2015, Warner/Chappell argued that Jessica Hill renewed the copyright to the songbook in 1921. In an appendix to his journal article, Prof. Brauneis argued that, as a successor in interest, Jessica Hill was entitled to obtain and hold a renewal of copyright and would have held it in trust for other family members. As renewed in 1921, the 1893 copyright for Song Stories for the Kindergarten would have expired in 1949, and the enforceable copyright to the Happy Birthday melody would have expired with it. After 1921, Mr. Summy and the original Clayton F. Summy Co. would no longer have been the “proprietors” of copyright for Good Morning to All. Instead, Jessica Hill would have become “proprietor.” According to that logic, the Happy Birthday melody, as published by The Cable Company in 1922 and later, would have been yet another pirate edition. Its “permission” was bogus. The “happy birthday” lyrics are a different story. Neither the 1893 songbook nor later editions of it contained the “happy birthday” lyrics, alone or in combination with the “good morning” melody. So far, briefs for Warner/Chappell have apparently failed to acknowledge lack of documented authorship and copyright coverage for the “happy birthday” lyrics, alone or in combination with the “good morning” melody, between at least 1893 and 1933. In the 1930s, successor management of the Clayton F. Summy Co. filed for copyrights involving the Happy Birthday song. However, they were for similar works with varying piano arrangements and additional lyrics. They did not address issues arising from combining the “happy birthday” lyrics with the “good morning” melody. At those times and since, there have been allegations of copyright infringement. So far, disputes over the Happy Birthday song have been settled privately, leaving legal issues of copyright unadjudicated. Potential outcomes: It is possible Judge King will find there have been no enforceable rights to the “happy birthday” lyrics or their combination of with the “good morning” melody, because there has been no clear evidence of authorship for the lyrics or the combination. It is also possible the judge will find potential rights connected with the melody of the Happy Birthday song were abandoned or had expired by 1922 or by 1950, either through acts or through neglect. If the judge somehow reaches the far side of those legal chasms, he will need to decide whether the 1930s copyright filings reflect rights of original authorship to the combination of the “happy birthday” lyrics with the “good morning” melody or whether instead they concern only rights to derivative works with different piano arrangements and additional lyrics. If inclined toward finding original authorship, the judge would also need to consider potential plagiarism in the filings. The money involved makes at least a trip to the Court of Appeals and a try at the Supreme Court likely, no matter what Judge King finds. However, pitfalls ahead for Warner/Chappell Music suggest a fair chance that in a few years the Happy Birthday song may be recognized as public-domain. Warner/Chappell Music might have to disgorge years of unearned royalties, depending on findings of culpability. Ms. Nelson’s lawsuit already has class action recognition. It seeks to restrict copyrights currently claimed for the Happy Birthday song from covering more than specific piano arrangements and additional lyrics, and in addition it seeks injunctive relief, royalty reimbursements with interest and costs. A victory by the plaintiffs would likely draw attention to other older copyright claims, including Sherlock Holmes stories, already public-domain in the UK. This entry was posted in Business, Grade schools, History, Information, People on August 8, 2015 by Craig Bolon. A regular meeting of the Board of Selectmen on Tuesday, August 4, started at 5:40 pm in the sixth-floor meeting room at Town Hall. The board has gone into semi-hibernation and probably won’t meet again in August. This rambling, sometimes cornball board often pushes the biggest problems far out into the night; maybe observers might give up and sign off. The last agenda item on this particular night was a zinger. $4 million funding gap: The town looks to be around $4 million short of money to rebuild Devotion School. To town administration, that was obviously stale news. The state had sent a funding letter on June 10. The Board of Selectmen did not put the matter on their agenda and let the public know about the problem until almost two months later. Last May 26, town meeting voted $118.4 million for the project, told by the board and the Advisory Committee to expect $27.8 million in state aid. Six weeks later, the state came back with only $25.9 million. Adding to a $1.9 million problem, the public schools still have no place for kindergarten through fourth grade students during the project. Old Lincoln School will be full with fifth through eighth grade students. At a morning meeting on August 4, according to board member Nancy Daly, Suffolk Construction of Boston, the general contractor, proposed to install temporary classrooms over the asphalt basketball courts behind the school along Stedman Street. That would cost another, unplanned and unfunded $1.8 million. Where can it all come from? Neil Wishinsky, the board’s chair, thought it could not come from the debt exclusion approved at the May 5 town election, saying voters had been “promised” some particular amount. He was mistaken. Mr. Wishinsky apparently forgot that voters approved a project–not an amount of funds. According to state law, that is how debt exclusion questions have to be worded. Up to the times of the town election and town meeting, Brookline had only estimates of total costs and of state funding. It was in no position to make promises to anybody about amounts of funds. The May town meeting was advised differently by the Board of Selectmen and the Advisory Committee. The board estimated debt exclusion would apply to $49.6 million in bond funding. [on page 8-25 of the warrant report] The committee estimated debt exclusion would apply to $44.6 million. [on page 8-69 if the warrant report] The town meeting endorsed neither estimate, and it appeared not to have authorized bond funding either. Instead, the town meeting approved a project total of $118.4 million, by a vote recorded as 222-1. Prior to the vote, Edward “Sandy” Gadsby, the moderator, did not say the motion included bonding, although the margin was more than required by law for bonding. So far, no one knows how much of the approved total might come from current revenue, how much if any from bonding and how much of the latter via debt exclusion. What looks nearly certain is that the total funds approved won’t cover the total costs. Waxy’s put on a better show than three weeks ago. Frank Spillane, the Foxborough lawyer representing the chain seeking to open at 1032 Beacon St., had reviewed Brookline regulations. Ashok Patel, the Woburn site manager, was slated to manage the Brookline site–no more questions about who the manager would be. Mr. Spillane and Mr. Patel had settled potential problems with some neighborhood representatives. Board members still proved wary. Although they approved licenses for a restaurant, full liquor service, entertainment and outdoor seating, they limited closing hours to 1 am and attached conditions, including outdoor service to end at 10:30 pm with clean-up completed by 11 pm, limits on noise, deliveries and smoking, little or no paper on the patio and multiple security cameras. Restrictions are still lighter than some at Chipotle on Commonwealth Avenue, where no alcoholic beverages can be served outside. As board member Nancy Heller observed, the ban on pitchers did not extend to sangria or margaritas. Personnel, contracts and finances: In a little over half an hour, the board reviewed and approved hiring for 25 vacant positions, and it approved six miscellaneous contracts ranging from $3,000 to $25,000. It is unclear why, in a community that employs an expensive town administrator with a staff of six, the Board of Selectmen would not delegate such matters, which it always approves. David Geanakais, the chief procurement officer, presented a contract to lease space on the third floor at 62 Harvard St. for classroom space. The contract distributed by the board was abridged to leave out the amount and cost of the space. Members of the board did not seem to think that important to tell the public about, but afterward Mr. Geanakakis said the first-year cost would be $129,000. Peter Ditto, the engineering director, won approval for two contracts with Susi and Sons of Dorchester for a total of $1.23 million, the main yearly contracts for street and sidewalk repairs. Susi was low bidder on the $0.95 million street repair contract but won the sidewalk contract only when another bidder failed to submit complete documents. This entry was posted in Business, Elections, Environment, Grade schools, Licensing, Meetings, Neighborhoods, Regulations, Services, Taxes on August 5, 2015 by Craig Bolon. The would-be IRS agent identified herself as “Kelly Johnson,” ID no. IRM0156, and said there was a payment for back taxes pending from 2009 through 2013. A suit would be filed in federal court if not settled today, Monday, July 27. The amount claimed was several thousand dollars. Ms. “Johnson” said the particulars would not be available until after papers had been filed, but someone from “the high ministry” could help. Thickening the plot: The Brookline Police Department has been warning for more than a year about telephone scams targeted at local residents. Since the U.S. IRS does not ask for quick payment over the phone, this sounded like one. The game would be to get some positive identification, if possible. Since we in the U.S. have agencies, offices, services and departments–not ministries–it sounded like a call from some parliamentary jurisdiction, although the potentially fake phone number had the Washington, DC, area code. A would-be “Don Fort,” claiming to be the IRS deputy chief of criminal investigation, had an Indian accent, more likely to be a person named something like Suresh Patel than something like Don Fort. Clipped vowels suggested an urban origin, maybe Maharashtra. When asked how a caller might know that he really worked for the U.S. IRS, Mr. “Fort” suggested checking his name with Google. Although that checked out, he didn’t. Mr. “Fort” seemed anxious for fast payment but said he could not accept a bank account or a credit card, as the U.S. IRS will do. Cash payment would have to be wired to an account, but he would not give the account number unless the cash were on hand and ready to wire. When asked, on an ordinary business day, for an IRS case identifier to check on the “claim,” Mr. “Fort” said he did not have one at hand. He was demurred with an excuse that we were responding from out-of-town and would have to call back. Stated to call IRS for lawsuit. Officer Hunter at the Brookline Police front desk took down basic information and said someone else from the department would come by to check. About a half hour later, Patrol Officer Dana Inchierca rang the bell, and we spoke for a few minutes. He was not familiar with the signature of this particular scam but said similar activities had been occurring frequently. Brookline Police lacked jurisdiction when no actual fraud or unwarranted disclosure of information occurred. Officer Inchierca said the FBI and the IRS might intervene. A call to the FBI Boston office got a referral to an IRS “hot line” number for telephone scams–impersonating an IRS agent–800-366-4484. That led, in turn, to a Web site for filing complaints. The site at http://www.tigta.gov offered a short form to list contact information and particulars. We filed a complaint. After five days, there had been no response. Catching crooks: Without more timely actions, the federal government stands unlikely to catch crooks practicing this scam and similar ones. According to Officer Inchierca, would-be perpetrators might easily be at locations other than telephone numbers suggest and even in other countries. If warned of exposure, they would likely decamp. As a result of Mr. Snowden’s recent disclosures, some federal officials are known to have real-time access to telephone traces. However, they will not catch many such crooks unless they are prepared to deploy tools promptly and unless they coordinate closely with local enforcement who can immediately visit premises, seize evidence and arrest suspects. We have published our names, address and Brookline land-line telephone number for over 40 years, so anyone at all interested in reaching us could easily accomplish the task. While that is some amount of public exposure, we are not inclined to hide. If you are targeted by a potential scam, you might do as we did–which Officer Inchierca confirmed to be a useful approach. Do not supply, verify or acknowledge any identifying information other than what you can be sure you already made public–including names, addresses, phone numbers, e-mail addresses, bank, account or ID numbers, social security numbers, legal counsel, employment data, business data or identifications of relatives, friends or neighbors. Do not worry over asking blunt questions or over making challenging comments. If you are puzzled or scared, simply hang up. Start a complaint by calling the Brookline Police Department, 617-730-2222. This entry was posted in Business, Services on August 1, 2015 by Craig Bolon.